While this article provided instructions on proper signing and sealing of engineering documents when it was first published, the rules have changed. Please refer to Chapter 61G15-23, Florida Administrative Code, posted on the Statues and Rules page on the FBPE website for current requirements. Starting in 2012, the Florida Board of Professional Engineers undertook the process of reorganizing and updating its Signing and Sealing rules (Chapter 61G15-23, Florida Administrative Code), which went into effect in November 2015. Then from the end of 2015 through to the end of 2017, based on input from licensees, these changes were refined and can be found on the Statutes and Rules page on the FBPE website. While the number of improperly signed, dated, and sealed engineering documents turned over to the Board seems to be decreasing, there remain those who do not seem to have kept up with the rules. Failing to comply with these requirements is a violation of our rules. As a result, FBPE has begun to issue Letters of Guidance and, soon, Notices of Non-Compliance for initial offenders. This article is aimed at helping licensees avoid violating the rules by highlighting a few key points on how to properly sign, date, and seal engineering documents. This article is offered only as an introduction and to provide guidance. Licensees are required, and strongly encouraged, to read and understand all of the rules that govern the practice of engineering within Florida in their entirety. Three key points warranting emphasis include: what needs to be signed, dated and sealed; physical documents versus electronic documents; and, how to sign, date, and seal engineering documents. 1) What Needs to Be Signed, Dated, and Sealed? In a number of cases, licensees — much to their detriment — failed to sign, date, and seal documents simply because their client didn’t require it. Even if a licensee’s client doesn’t require it, the licensee is required to sign, date, and seal engineering documents if the rules require it. Confusion also comes into play with the term “filed for public record.” In a number of other cases, licensees have failed to sign, date, and seal documents because the document was not intended to be filed for public record. Again, licensees are required to sign, date, and seal all documents required by rule, which include far more than those simply intended to be filed for public record. Physical documents must be physically hand signed, dated, and sealed. Electronic documents must be either electronically or digitally signed, dated, and sealed, and no longer comply with the requirements of Section 471.025(1) once they have been printed because the authenticity of the signature and seal can no longer be verified. While an electronic (scanned) copy of a physically signed, dated, and sealed document is suitable for archival purposes, it is not considered to be an original signed, dated, and sealed document. Likewise, the printed copy of an electronic document is suitable for archival purposes but it is not considered to be an original signed, dated, and sealed document. Section 23.003, Procedures for Physically Signing and Sealing Plans, Specifications, Reports or Other Documents, addresses in detail how to sign, date, and seal physical documents. While, Section 23.004, Procedures for Digitally Signing and Sealing Electronically Transmitted Plans, Specifications, Reports or Other Documents, addresses in detail how to digitally sign, date and seal electronic documents, and Section 23.005, Procedures for Electronically Signing and Sealing Electronically Transmitted Plans, Specifications, Reports or Other Documents, addresses in detail how to electronically sign, date, and seal electronic documents. Placement of the date that the document has been sealed and signed is required regardless of whether the document is physically or electronically transmitted. The signature and seal however vary according to whether the document is physically or electronically transmitted. Both physically and electronically transmitted documents require that the date the signature and the seal are affixed be placed immediately adjacent to the signature. It is not however required to be placed beneath the seal. Chapter 61G15-23.001(4)(d), F.A.C., The date that the signature and seal is affixed as provided herein shall be entered on said plans, prints, specification, reports or other documents immediately adjacent to the signature of the professional engineer. Physically transmitted documents require that the licensee create by hand an original of the licensee’s signature. A scanned, facsimile, digitally created or copied image of the licensee’s signature is not allowed on physically transmitted documents. Chapter 61G15-23.003(1), F.A.C., The licensee shall sign by hand an original of the licensee’s signature on each page required to be sealed. A scanned, facsimile, digitally created or copied image of the licensee’s signature shall not be used. As for creating the seal, physically transmitted documents are allowed to be embossed, sealed using a wet stamp, or contain a digitally created seal (as part of the border). 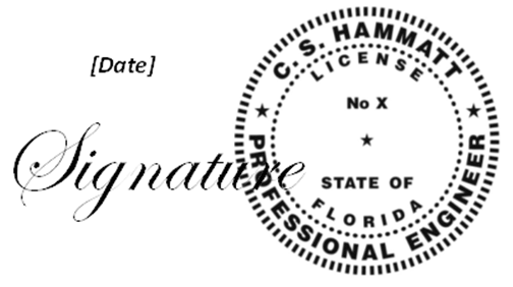 In each of these cases the seal is to partially overlap the licensee’s signature such that the signature is not made illegible. Chapter 61G15-23.003(2), F.A.C., The licensee must then use a wet seal, a digitally created seal, or an embossing seal placed partially overlapping the licensee’s signature on each page required to be sealed. The placement of the seal shall not render the signature illegible. Similar to physically transmitted documents, electronically transmitted documents are required to contain the date it was signed and sealed (located immediately adjacent to where the signature would appear), and are permitted to have a digitally created seal. However, unlike physically transmitted documents, electronically transmitted documents are not allowed to include a scanned or digitally created image of the licensee’s signature. More importantly, electronically transmitted documents are required to contain a statement clearly indicating that the document has been electronically signed and sealed, and that printed copies of the document are not considered signed and sealed. This is required so that the recipient of a printed copy of an electronically transmitted document will know that the printed copy is not an original signed and sealed copy. As for signing and sealing, electronically transmitted documents are considered to be signed and sealed by virtue of the fact that the licensee has electronically marked the document, thereby indicating that the document has been corrupted in the event any changes are made after that point. Electronically transmitted documents can be signed and sealed by one of two methods: digital signing and sealing; or electronic signing and sealing. For all of the requirements, please visit the Statutes and Rules page on the FBPE website. Within the document, if a digitally created seal is not used, the required text is to appear where the signature would normally appear. Within the documents themselves, if a digitally created seal is not used, the required text is to appear where the signature would normally appear. For more information on proper signing and sealing please view the free Signing and Sealing webinar on the FBPE website. William C. Bracken, PE, SI, CFM, is a licensed Professional Engineer and Special Inspector in Florida, and is the president and principal engineer for Bracken Engineering, located in Tampa. Mr. Bracken has served on the FBPE Board since 2012 and served as Board chair for the years 2015 and 2016. He also served as FBPE’s vice chair for the years 2013 and 2014.